Nobody performs better under pressure. Regardless of the task, pressure ruthlessly diminishes our judgment, decision-making, attention, dexterity, and performance in every professional and personal arena. In Performing Under Pressure, Drs. Hendrie Weisinger and J.P. Pawliw-Fry introduce us to the concept of pressure management, offering empirically tested short term and long term solutions to help us overcome the debilitating effects of pressure. Performing Under Pressure tackles the greatest obstacle to personal success, whether in a sales presentation, at home, on the golf course, interviewing for a job, or performing onstage at Carnegie Hall. Despite sports mythology, no one "rises to the occasion" under pressure and does better than they do in practice. The reality is pressure makes us do worse, and sometimes leads us to fail utterly. But there are things we can do to diminish its effects on our performance. 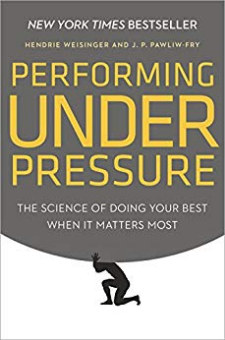 Performing Under Pressure draws on research from over 12,000 people, and features the latest research from neuroscience and from the frontline experiences of Fortune 500 employees and managers, Navy SEALS, Olympic and other elite athletes, and others. It offers 22 specific strategies each of us can use to reduce pressure in our personal and professional lives and allow us to better excel in whatever we do. Whether you’re a corporate manager, a basketball player, or a student preparing for the SAT, Performing Under Pressure will help you to do your best when it matters most.